I almost always have a freezer full of homemade wontons and this soup is by far my favorite way to eat them. 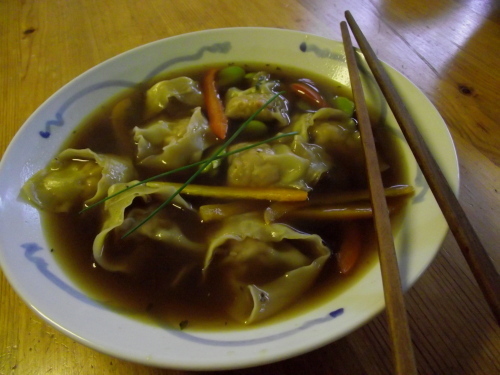 With the wonton already made and waiting in the freezer, this soup is almost ridiculously easy to make, and depending on how many wonton you put in it, it can be a pretty substantial lunch or dinner. (It’s really amazing how filling those little babies are!) If you haven’t given my homemade won ton recipe a try you can also make this soup with udon noodles which can be picked up at most grocery stores. The noodles are really good, but the wonton are better!!!! In a large pot bring your stock, 5 spice, ginger, garlic, soya, sesame and carrot to a boil and then turn it down to a gentle simmer until the carrots are still slightly firm. Add frozen wonton (or udon noodle) and red pepper and simmer for 5 minutes. Garnish bowls with sliced green onion.